After Barack Obama is sworn in next week, he'll be able to enjoy one of the lesser-known benefits of the presidency: phone calls that always go through. That means no more "all circuits are busy" messages. And no waiting for calls to be completed as millions of people crowd into Washington during the inauguration and jam overburdened cell phone towers, despite what have been practically heroic efforts on the part of carriers to add capacity. It may sound a bit like a storyline from "The West Wing," but there actually is a branch of the government called the National Communications System tasked with ensuring that telecommunications related to "national security" remain intact and ready to use. President Kennedy created NCS in 1963, and its mandate has expanded to include high-priority Internet and mobile phone calls too. "We found that this program was very helpful during September 11," said Robert Kenny, director of media relations for the Federal Communications Commission's Public Safety and Homeland Security Bureau. "We think it's necessary across the board at all levels of government." Kenny said in an interview this week that NCS' priority-call system, which has been moved from the Defense Department to Homeland Security, is "for emergencies and other times there's a need to get calls out." That's in addition to private Defense Department networks, some of which are satellite-based. Homeland Security did not respond to queries about NCS on Thursday. NCS says that the GETS system is designed to support tasks including "presidential communication," continuity of government, and access to the emergency broadcast system. Once the ID number is verified, the telephone network marks the call as a high-priority one, meaning it's specially routed and exempt from being blocked because of congestion or network overload. A 1984 executive order signed by President Reagan lists NCS's duties as: "National security and emergency preparedness communications for the federal government under all circumstances, including crisis or emergency, attack, recovery and reconstitution." In 2001, the government added an additional high-priority system for mobile phone users. It's called Wireless Priority Service, and gives authorized users including what NCS calls "senior members of the presidential administration" a higher-priority connection to the cell tower. WPS is accessed by dialing *272 before the destination phone number--but, alas, will only work if your mobile provider has authorized your phone. And the federal government needs to approve. "In times of an emergency that's a huge advantage for public safety," said John Taylor, a Sprint spokesman. Taylor said that WPS will come in handy next week during the inauguration. "For the inauguration, we are planning for 2 million people," he said. "We've said up front, if there are more than 2 million people, our customers will have problems. But we're confident public safety will not have problems because of this service." FCC documents (PDF) from 2000 provide a glimpse at the deliberations during the wireless system's creation. The agency concluded that a uniform *272 number was useful because otherwise "communications service users would have to change systems under conditions when compatibility is most important, i.e., during the exercise of the president's war powers." Authorization to use WPS is ranked by five different levels. The highest priority is reserved for, according to NCS, "National Command Authority support for military command and control critical to national survival" and "support for the conduct of diplomatic negotiations critical to arresting or limiting hostilities." Law enforcement and public utility companies receive a lower-priority WPS status. 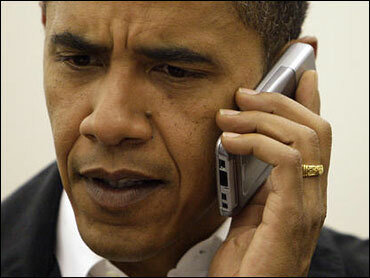 If Obama does end up ditching his BlackBerry for General Dynamics' Sectera Edge, a combination phone-PDA that's been certified by the National Security Agency, he won't be the first government employee to use it for priority calls. "Priority services as well as other security elements were considerations in the design of the device," according to a spokesperson for General Dynamics. The NCS has also taken some steps to find similarly-bulletproof ways to prioritize Internet communications. It's a far harder problem, of course, because the protocols underlying the Internet lack a reliable way to mark communications as White-House-high-priority, and the network is packet-switched and far less centralized. A 2004 report lists responses from the Internet industry to the NCS's request for suggestions about prioritizing governmental data communications including video chats and voice over Internet Protocol, or VoIP. It admits that "NCS cannot cause a paradigm shift within the Internet to meet these goals," one of which is "national leadership must receive end-to-end priority treatment over other users." It concluded, sensibly, that more research was required.